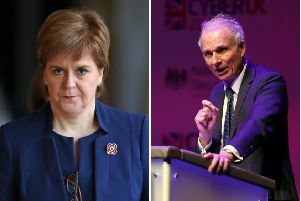 First Minister Nicola Sturgeon has described the charge imposed by Halfords as "shocking"
More than £940 million of taxpayers’ cash has been lost to waste and projects going over budget in Scotland’s ­public sector since the SNP came to power, say the Scottish ­Conservatives. The figures have been unveiled in a dossier which is calling on ministers to cut waste and hand the savings back to families and businesses in the form of tax breaks in finance secretary Derek MacKay’s budget this week. The report, entitled Mackay’s Missing Millions, claims the cost of over-budget government projects and departmental waste since the SNP came to power now runs to £431.5m. When other public sector cost overruns in Scotland, for which the Scottish Government has partial responsibility, are included it reaches £947.7m since 2007. ­Scottish Conservatives finance spokesman ­Murdo Fraser said: “The SNP claims it can’t afford to give Scots the same tax break as people will receive ­elsewhere in the UK because there isn’t enough money. “Our dossier published today shows that this is total nonsense. The ­money is there – it’s just that it’s being frittered away. “Hundreds of millions of pounds has been frittered away on bungled IT projects and cost overruns. Among the projects hit by overspends are £76m on the Common Agricultural ­Policy IT system and £50m on the NHS 24 advice line, along with £18m in support for loss-­making Prestwick ­Airport, which was taken over by the Scottish ­Government. About £60m of overspends were recorded in the ­Scottish Government’s consolidated accounts on ferry services, along with £30m on roads and £13m on education. Projects which the SNP ­government is partially responsible for include the £379m which went on over-budget major rail schemes and £95m on the Edinburgh Royal Hospital for Sick Children redevelopment. But the claims were ­dismissed by a spokesman for finance secretary Derek Mackay. He said: “We have a strong record on efficiency ­savings so will take no lectures on waste from a Tory party which is squandering ­countless ­billions on Trident weapons of mass destruction. “Ruth Davidson’s bogus ­rhetoric on tax is exposed by the fact she wants to tax ­sickness and education by bringing back prescription charges and tuition fees. “Her party is cutting ­Scotland’s budget by £2.9 billion, 9 per cent in real terms, by the end of this decade compared with when they took office at Westminster. “Our tax proposals were in our manifesto, which was resoundingly backed in the election just over six months ago.